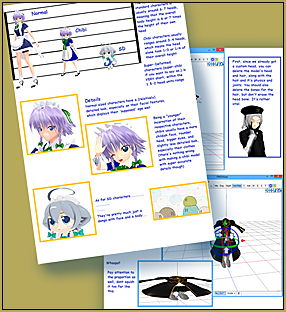 What is a chibi model in MikuMikuDance? How do I make a Chibi model? Can I use PMDE / PMXE to make a Chibi model? Hello everyone, welcome to Silent Headset and co.’s PMDE tutorial! Hosted today by yours truly, Silent Headset! First off, what is a “chibi character”? You can MAKE a Chibi Model for MMD! Making a chibified MMD model is quite an easy task, if you know what you’re doing. Make sure you have all the ingredients needed; the sugars, spices, and everything nice. See the PDF for the full instructions. Get the full story. 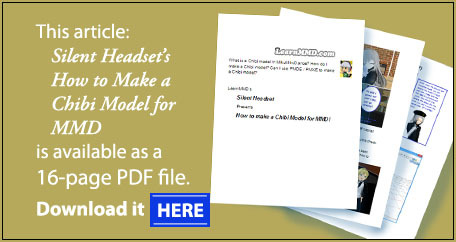 Click the image, above, to open/download Silent Headset’s PDF! You might find it useful to try bone scaling in the transformation window. No, it doesn’t work for morphs, but you can save the scaled model from the transformation window. It’s a great way to alter proportions, with a lot more control than widget scaling. Thank you for the info! I’ll definitely try that out later! Like I always said, there’s always more than one way to achieve something regarding editing models. It’s just a matter of finding what method suits you best.